I decided to do a bit of a ‘write up’ of my day, mainly because I don’t work Tuesdays, and so it’s bike day. 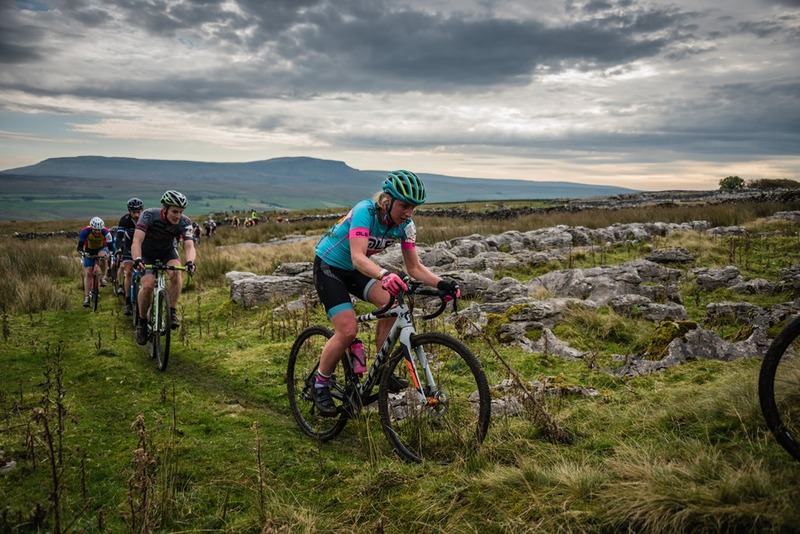 However, I'll be honest, to win the women’s title at the 3 Peaks CX this year, I had to dig very very deep; consequently, I was broken. Typing seemed more appealing! If anyone enjoys reading this, brilliant. Otherwise, it will be like a diary for me next year, when I’m panicking about my 2018 performance! In last year’s 3PCX, I was underprepared, but with a respectable level of running and riding fitness, I surprisingly finished as 4th lady, and the Highest Placed First Timer. I was pleased with how the race went, given that I was riding a demo bike and had little idea of what to expect, but nobody likes 4th place do they?! 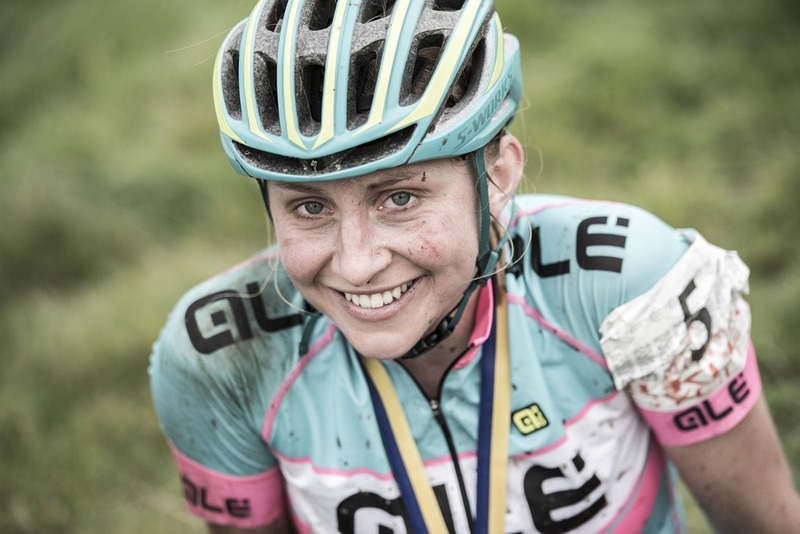 I left the event, promising myself that I’d buy a CX bike, and train to win the year after…. Working in a bike shop, I managed to invest in a Scott Addict CX 20 frame, a Shimano Ultegra Hydraulic CX groupset, and some Hope CX wheels, along with a few finishing bits. By the time that I’d got it built (OK, I didn’t build it, but my long suffering colleagues/on call mechanics Matt and Ian did), the CX season was almost over, but I managed one race, and finished 3rd. Not what I was after, but a good starting point. Winter was spent doing long, cold and often miserable miles in preparation for the Fred Whitton Challenge in May. I’d set my sights on sub 7 hours, so when the day finally arrived and I finished in 6 hours 46 minutes, it felt like the hard miles had been worth it, and importantly, I had gained a good base fitness for the summer. I came back to Cumbria a little bit fitter, a lot browner (now faded!) and with a new sense of motivation for the result that I wanted in the 3PCX. At the end of August, I rode in the Hope Pre Peaks event-it was a fantastic chance to do a hard ride, on an unfamiliar route. The week after, I did the #rideforCharlie Scott MTB Marathon in the Peak District. Whilst a lack of recent MTBing definitely showed, I enjoyed the day, with a 65km route to rival the Lake District, amazing atmosphere, and a highly worthwhile cause. What’s more, it was nice to have a break from the CX bike, doing an event for the enjoyment, rather than a result. That left me with 3 weeks to go, so I entered my panicking, fitness-doubting, stage. I suddenly felt sluggish and worried that I hadn’t done enough training, yet I was tired and so couldn’t possibly achieve what I had set out to achieve. On my ride home from work a couple of weeks before the event, on a rainy, windy evening, I rode via the start of the last of the Barrow Central Wheelers (my club) hill climbs. Despite vowing a few years ago at a university event never to do a hill climb again, I found myself handing over my £3 and lining up. It felt so awful that I nearly unclipped half way up and packed in, but I somehow reached the top. It hurt…a lot. To my astonishment, I’d won the ladies race, taken over a minute off the ladies record, and placed 6th overall. This was a big boost to my confidence, realising that I was just feeling fatigued from working hard, and there was strength in my legs afterall! Finally, the big day arrived, and I’d put so much pressure on myself that I felt horribly ill pulling into the carpark. Fortunately my friend Heidi appeared, and told me to snap out of it; I was being ridiculous! I went for a spin, and made sure I was back at the start in plenty of time. As we clipped in and rolled over the line, I was feeling better, and made up some places before the first climb. The fields between Selside and Simon Fell were frustratingly soft, and what should have been rideable, turned into a run, followed by the horror of Simon Fell which I remembered very vividly indeed-screaming calf muscles, face to the grass and praying that you don’t miss a step! With my running background, and brand new but mega-grippy Specialized Motodiva shoes, this is where I felt that I should have been strong, but no matter how hard I tried, my pace didn’t seem to increase. The succession of boggy ruts on the descent was worse than I could remember, but kept myself mildly entertained with the quantity of ‘OTBs’ (I had plenty of near misses!). Once back on the road, I felt strong and regained the lead that I had lost on the last descent; I even towed a train of chaps along to Chapel le Dale for a while! What was I thinking?! 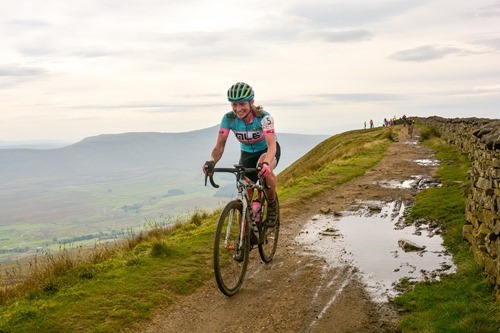 I had reccied Whernside the week before on foot with my dog Max, but there didn’t seem to be many sneaky lines on the climb, so I resigned myself to my position in the line of riders and tried to conserve as much energy as possible. 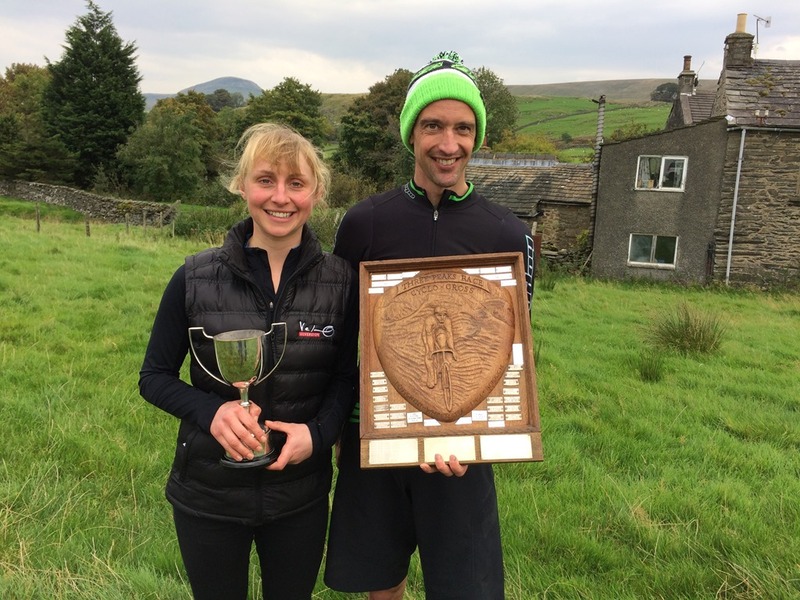 Once again, whilst in a fell race, I make up all my time on the climbs, this wasn’t to be. I would just have to find some inner courage on the descent. 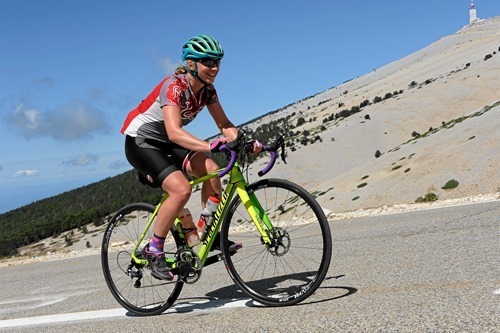 I rode far more than I expected to, although admittedly I did some rather pathetic screeching as I gathered pace down the slab staircase, unable to stop, and somewhat relieved when the gradient eased! Unfortunately however, my descending still wasn’t good enough, and I was once again caught by Sarah Barber. I knew that I’d have to give it everything I had on the road and close the gap. I can take a lot away from this event, but mainly, a big confidence boost that if I put my mind to something, even if at the time it seems unrealistic, it can be achieved. With more experience and some focussed training, I hope to be back for another win next year, and a successful year in between! Thanks so much to the Velo gang for getting my trusty Scott sorted (and tolerating my nerves! ), and Lee and Stu for carrying a spare wheelset around on E bikes. Thanks also to everyone who came along to support, offering food and bottles, and shouting at me to pedal faster. What a great day! 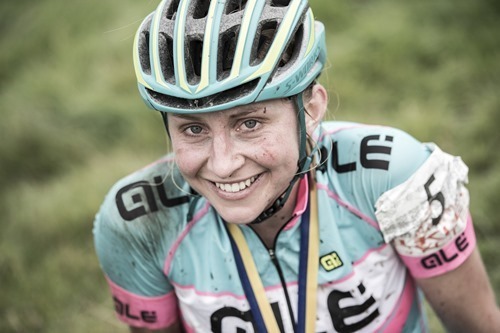 Photos by Griffe Photo, Steve Fleming, Racing Snakes, Joolze Dymond and Anne Fisher.